Map of the City of Providence, Rhode Island, 1875. An exceptionally scarce large format 1875 map of Providence, Rhode Island. Centered on the Providence River and Harbor, this map covers all of downtown Providence as well as much of the surrounding area as far north as Pawtucket, west to Knightsville, Cranston, Sockanosset, and Silver Lake, south to Warwick, and east to include East Providence. The map identifies all streets, ponds and lakes, parks, proposed landfills and improvements, rail lines (extent and proposed), piers, official buildings, major business, and the residences of prominent citizens. From City Hall concentric circles radiate at 1/4 mile intervals. The site and many buildings associated with Brown University are prominently shown. The map includes parts of Narragansett Bay south roughly as far as Bullock's Neck and Pawtuxet. The city seal of Providence appears in the upper left quadrant. This map was compiled by Henry F. Walling. It was published by J. C. Thompson of 186 Westminster Street, Providence, in partnership with Sampson Davenport and Company of Boston, Massachusetts. It was engraved and lithographed by J. H Bufford's Sons, also of Boston. This map is extremely scarce with the OCLC identifying only 4 examples and no other examples currently on the market. J. C. Thompson (fl. c. 1860 - 1890) was a Providence, Rhode Island based publisher active in the later part of the 19th century. Thompson partnered with various other publishers including Henry F. Walling and George Sampson to produce a small corpus of Providence and Rhode Island focused maps, guides, views and directories. George Sampson (fl. c. 1858 - c. 1930) was a Boston based publisher and printer active in the second half of the 19th century. Sampson initially partnered with George Adams, acquiring a half-share in the Boston Directory or Boston Almanac, and subsequently publishing as Adams, Sampson, and Company. Adams shares were eventually acquired by O.H. Davenport in 1865, when the company named changed to Sampson and Davenport. 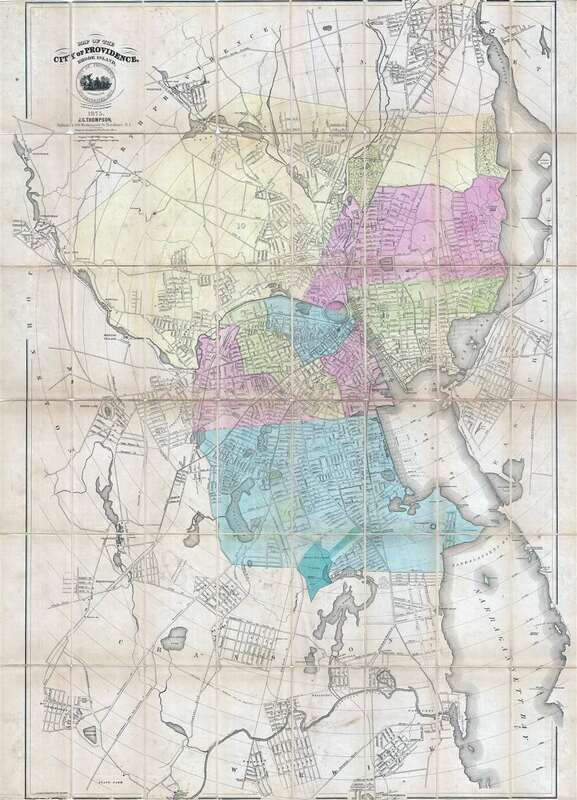 Working with Davenport, Sampson, expanded the scope of the Boston Directory to incorporate other towns and regions, producing the Massachusetts Register, the New York State Business Directory, the New England Gazetteer, the Roxbury Directory, and the Providence Almanac, among others, as well as various individual maps and guides. Davenport's shares were acquired by A. Murdoch in 1884. As Sampson and Murdoch, the firm expanded again, producing a catalog of over 120 city directories by 1925. The business passed into the hands for R. L. Polk and Company around 1930 and continued to publish directories until about 1980. Good. Map exhibits some overall toning and edge wear. Dissected and mounted on linen by publisher for easy folding and unfolding, however, original linen has worn and split in places, at which point we have introduced verso reinforcement. Boston Public Library, Leventhal Center, G3774.P9 1875 .W3x. OCLC 317749691. Phillips (America), page 726.